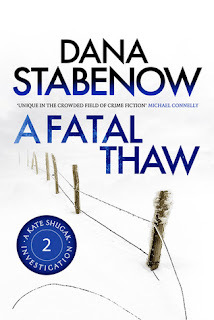 Several years ago I read the very first Kate Shugak novel by Dana Stabenow, A Cold Day for Murder. I'll be honest, I was a bit underwhelmed and wondered why the series was so popular. I didn't dislike it, but neither did I love it to bits. But things change. My son-in-law has been working his way through the series and his enthusiasm has made me think about the series again, so that when I saw book two, A Fatal Thaw, in the library last week, I grabbed it to see if I might be a bit more impressed this time around. Spring is just beginning in Alaska, the thaw has started, and Kate Shugak is spring-cleaning after the long winter. Twenty miles away a mass murderer sets out on a killing spree and by the time he has finished nine people lie, shot dead, in the snow. His insanity, for that's what it is, shocks the entire local population but more shocks are to come. Ballistics reveal that one of the dead, Lisa Getty, was killed by a bullet that was different to the rest. The mass murderer did not kill Lisa, someone else did. Having narrowly escaped being killed by the killer herself and being the one to eventually capture him, Kate feels this personally. She's a resident of the state park and thus the perfect person to investigate Lisa's murder, albeit rather reluctantly. The big problem is that rather a lot of people had reason to do away with Lisa. She had slept with so many married or attached men that most of the women in the park are not at all upset about her death. It also turns out that Lisa was involved in some shady dealings and may have been killed in connection with those. It's a can of worms. When someone tries to kill Kate herself, and another body turns up, things turn even more ugly and it's a race against time to bring the culprit to justice or he/she could well escape forever. Well, well, who'd have thought that my thinking on this series would have undergone such a radical transformation. I'd didn't dislike the first book at all, I was just a bit 'meh' about it, as Americans would say. But this was a different matter entirely, a truly excellent read. In truth, I whizzed through it, quite unable to put it down. There is nothing tentative or uncertain about the coming of spring in the Arctic; it does not creep in unannounced. It marches in at the head of an invading army, all flags flying, brass band playing, soldiers at present arms and knee-deep in ticker tape and cheers. I also the enjoyed the murder mystery aspect of the story. I had some idea of who had done the deed but wasn't sure. There were quite a few different characters who could've done it, all quirky and so well described that I found most of them easy to picture. Kate herself is an excellent main 'detective' character. Her Indian heritage makes for some fascinating insights and scenes that wouldn't appear in your run of the mill detective yarn! I like the romantic aspect, which never overwhelms the plot but fits in nicely, and am wondering where that's going... nowhere obvious I suspect. It won't take a genius to guess that I now plan to read on in this series. Book 3, Dead in the Water, is already on my library pile (along with 10 other 'must read' books) and I honestly can't wait to read it. Findings by Kathleen Jamie is my book three for the 2016 European Reading Challenge which is being hosted by Rose City Reader. The European country it represents is 'Scotland', which is the UK country I've chosen to cover, purely because on my one and only trip there I fell in love with the place. It's quite a difficult task to review this one as it's a series of essays that the author has written and I'm not very good at reviewing essays. 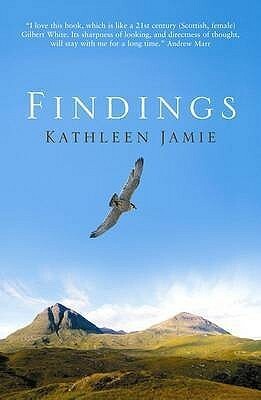 So, let's see... Kathleen Jamie lives somewhere in Fife, in Scotland. She lectures in creative writing at St. Andrew's University and is also a poet. In her spare time she has a huge interest in wildlife, particularly birds, and travels around Scotland, seeking out beautiful places and the wildlife that makes those places special. Thus, we see her going to see the salmon trying to get upstream on the Braan river in the Highlands and discovering rather a sad secret about them. She also travels extensively around the Hebrides, exploring islands and looking for oddities such as the skeleton of a gannet's head but finding instead a whale's scapula. She sees and is saddened by how inhabited these islands once were, and now are not, after the Highland clearances of course. Close to where the author lives are the nests of peregrine falcons and ospsreys and on one memorable occasion she sees a crane flying overhead. Her observations of these beautiful birds make for delightful reading. Also enjoyable to read about was her trip to the Hebridean island of Coll to try and see the elusive corncrake. These birds were once commonplace on mainland Britain but were wiped out by new farming practises sixty or seventy years ago. One section that didn't work for me was that of her visit to The Royal College of Surgeons to see the Surgeon's Hall and its exhibits. Some of them were rather strange, almost macabre, not that I was bothered by it, just not terribly interested. Another departure from wildlife was her look at the skyline of Edinburgh from atop one of its high buildings. Even though I've never been to that city I found that very interesting and it made me wish I had been to what is surely a very beautiful and historic city. One day, hopefully. Catching up today with a couple of crime titles that are about as far apart contentwise as it's possible to get! I suppose that's me in a nutshell, my book tastes range far and wide and I love variety of settings in my reading. And these two certainly are different. Anyway. First up is Miss Pym Disposes by Josephine Tey. This is my book eight for Bev's Mount TBR 2016 challenge and my book four for her Vintage Mystery Cover Scavenger Hunt challenge, covering the category 'More than two People'. This is a vintage crime story set in the 1940s. Quiet, unassuming Miss Lucy Pym has become a minor celebrity by writing a no-nonsense book on psychology. A former school friend, Henrietta Hodge, is now headmistress of a college for the training of Physical Education, teachers, Leys, and invites Miss Pym to come to the school for a one-off lecture on psychology. Miss Pym finds herself very smitten by the college and its pupils. It's a new experience for her and she's astonished by how hard the students work, how committed they are to their studies and also how charming a bunch they are, especially in their dealings with her. It seems like a perfect, insular, little world, untouched by outside influences. When the course is over, the students are all placed in new, paid jobs. One girl in particular is destined to go far. But it doesn't happen and a nasty accident follows upon this disappointment, one which Miss Pym soon realises is possibly not an accident at all. She is forced to realise that Leys is not a miniature utopia at all, and the decision about whether or not the college can survive might well be hers. Well, this is yet another little gem from the pen of Josephine Tey. After reading The Franchise Affair, which I felt was more of a standalone than an Alan Grant instalment, I wondered if any of her real standalones might be worth a read. Good decision because they absolutely *are*. It seems to me that Josephine Tey was very good on describing small, insular worlds, places where things hadn't changed much in donkey's years... small towns and villages for instance and, in this case, a college of further education. (She apparently worked in a college for physical education so presumably knew what she was writing about.) She knew too that things were not always as perfect as they seemed in these places, especially when it came to them being described as having no crime or bad behaviour. It was ironic too that Miss Pym, the writer of the book on psychology, turned out not to be that good a judge of human behaviour after all. Such is life sometimes. I enjoyed this lovely little book tremendously, the world Tey created was fascinating, the interactions of the students, teachers and Miss Pym, the more gentle and less hectic days of the 1940s and just the overall atmosphere of the book. As I said, a little gem. Lastly, Murder as a Fine Art by David Morrell. This book was recommended by my lovely friend, Pat, at Here, There and Everywhere. Thomas De Quincey is the notorious 'opium eater' of the book, Confessions of an Opium Eater. A resident of Edinburgh, he travels to London with his daighter, Emily, and gets caught up in a mass murder investigation. Five members of the same family, adults and children, have been slaughtered and mutilated in their home. It mirrors a similar mass killing some years before, known as the Ratcliffe Highway killings, a real life event which De Quincey wrote about in some detail in one of his essays. As a consequence he comes under suspicion as the murderer because whoever did it knew about the other killings in fine detail. The newly formed detective unit arrest him but two of its officers RYan and Becker, are not convinced and, along with Emily, set out to prove his innocence. In order to do that they also need to find out who did actually do it, before the killer can replicate another mass killing which happened twelve days after the first event. What soon becomes very clear is how dangerous this killer is. It seems he will stop at nothing and no one in London is safe until he's been brought to justice. What to say about this one other than, 'If you like Victorian crime stories with a Dickensian bent then this is for you'. It's a bit gory, I will say that, but it's not horribly so. 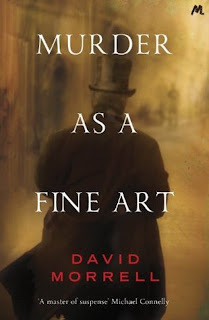 David Morrell (he wrote Rambo apparently) is a very skilled writer and he brought Victorian life in all its poverty and seediness and dense fog to life for me. It's full of wonderful little history lessons about London, which might sound boring but it's really not. Why were certain streets named as they were? Well, Pall Mall is after a popular game apparently and Piccadily is something to do with someone who made lace collars. What was the connection between The British Empire and the opium trade? Well, it was all pretty murky and conniving and worth reading this book just to find out a lot more about it in my opinion. I liked the use of Emily De Quincey's diaries to enhance the story, I liked the fact that it wasn't necessary to have read Confessions of an Opium Eater in order to understand the story, as I have not (I plan to), and I liked the interactions of the two detectives, Ryan and Becker, as they go about their business on the crime ridden streets of Victorian London. All in all a stonking good read and I'm very much obliged to Deslily for finding the book and recommending it. I already have book 2, Inspector of the Dead on my library pile and can't wait to read it. 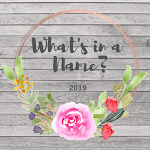 My seventh book for Bev's Mount TBR 2016 and my third book for her Vintage Mystery Cover Scavenger Hunt 2016 (covering the category 'A Dead Body') is Whose Body? 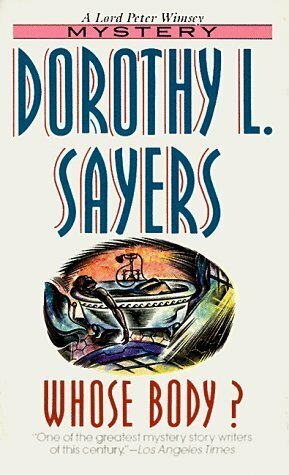 by Dorothy L. Sayers. Lord Peter Wimsey's mother, the Dowager Duchess of Denver, asks him to investigate something that has happened to an architect friend of hers. It seems the man got up in the morning and discovered a dead body in his bath: a dead body with pince-nez perched upon his nose. The architect, Thipps, claims never to have set eyes upon the man before, so how could his body have got into his bath? The window was left open so it could have been brought in by that route but the police don't believe it and arrest Thipps and his secretary for murder. Wimsey discovers from a policeman friend, Parker, that a wealthy businessman called Levy has gone missing, and that the missing man bears a remarkable resemblance to the dead man in the bath... although it is not him. Examining the body Wimsey sees that the unknown man has recently been given a haircut and shave and thinks it must've been after his death. Because of the resemblance to the missing businessman, Wimsey and Parker wonder if there must be some connection between the two mysteries, but there is no real evidence to support this theory. One thing Wimsey is sure of though, Mr. Thipps did not commit this murder and it's up to him to try and prove it. Well, this is the first Lord Peter Wimsey mystery, and though I've so far read a good handful of the series I hadn't read this one, so I thought it was about time I did. Generally speaking when approaching a new to me series, I religiously start at the beginning but a few people suggested I read the books that feature Harriet Vane first. So I did that (apart from Busman's Holiday which I'm sort of saving) and then cherry picked a couple of others. Thus, I'm all over the place with them really, but coping ok with that, but I think now I'll mainly move forward rather than all over the place, reading what I fancy, willy-nilly. Anyway, this was very enjoyble indeed. Astonished at how good this was for a first novel, often you need to be a bit forgiving with first books but not so in this case, the writing is intelligent and superb . The mystery is solid, I had some idea of what had happened but the eventual outcome and who had done the deed and particularly why, I didn't guess at. Ingenious. Loads of wonderful humour too, both in the narrative and the dialogue. I wish I'd jotted down a few quotes but homelife is a bit chaotic at the moment. My kitchen's being renovated and looks like a bombsite and other rooms in the house are also being decorated with their contents, including my books (! ), spread into any rooms that will take them. It's chaos to be honest and quotes, good as they might be, are a bit beyond me. So now I've read the first two Wimsey books (Clouds of Witness is book two and I read that last year) and number three is Unnatural Death. I popped to the library yesterday and lo and behold there it was on the shelf, so I nabbed it... along with an Edmund Crispin and a Gladys Mitchell. I do love a bit of vintage crime. 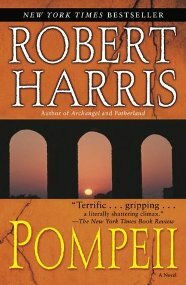 My interest in books about ancient Rome continues unabated and the latest offering is Pompeii by Robert Harris. This is my book six for Bev's Mount TBR 2016 and my second book for the European Reading challenge 2016, being hosted by Rose City Reader, and it covers the country of Italy. Marcus Attilius Primus, known simply as 'Attilius', is the latest in a long family line of aquariuses... men who attended to the startling feats of engineering that were the Roman aquaducts. He's been appointed to the Aqua Augusta, the aquaduct which supplies fresh water to the Bay of Neapolis (present day Naples) where such towns as Herculaneum, Neapolis and Pompeii were situated in AD 79. The previous encumbant, Exomnius, has disappeared off the face of the Earth and no one has any idea where he's gone. There have been some odd occurences lately, strange disturbances in the ground, wine glasses vibrating on tables, sulphur in the water that kills the fish in a fish-farm. Then a crisis on the Augusta aquaduct happens, a blockage has occurred, and Attilius needs to find it or the water supply to every town on the bay will dry up within a day. Attilius thinks the aquaduct blockage is somewhere on the slopes of Mount Vesuvius and suggests to the scholar and local leader, Pliny, that he be allowed to mount an expedition to find it and clear it: he will organise this expedition from Pompeii. When he arrives in Pompeii things are naturally a lot more complicated than he imagined. Local politics and businesses are corrupt with the town being run from behind the scenes by an ex-slave, Ampliatus. Attilius further complicates things for himself by becoming attracted to Ampliatus's daughter, Corelia, who is engaged to be married, against her will, to a local politican. It's a can of worms and no mistake. And over it all looms Vesuvius and although the Aquarius realises something isn't right, neither he nor anyone else has any idea what the mountain has in store for the population around the bay. The action in this book takes place over four days with time ticking away at the start of each chapter leading, of course, to the eruption of Mount Vesuvius in AD 79. It reminded me of one of those disaster movies where every now and then sub-titles come up to tell you what the time is, so by the time the actual catastrophe happens you're on the edge of your seat practically having a nervous breakdown. And it does take a while to get to the eruption itself, about page 200, so just 50 pages on the event itself. I was fine with that as the plotline is an interesting one. Given we all know what the outcome is, it was down to the author, Robert Harris, to keep the reader interested in events leading up to it and the story of the search for the cause of the problem with the aquaduct was a fascinating one. Details of how they worked kept me absorbed and the human story of Attilius and his relationships and problems kept me entertained. The eruption itself definitely raised the level of excitement several notches though. The detail and the horror of it was very well described given the author had 'presumably' never experienced such a thing. And of course you yourself are wondering if Attilius and Corelia survive and if people you don't like will get their come-uppance. It's all very well done and I enjoyed Pompeii immensely. I've never read anything by Robert Harris before but will definitely read more now... he's written a Roman 'Cicero' trilogy which I gather is very good. I also fancy reading some non-fiction about the eruption and there is plenty I know. Mary Beard has what sounds like a good book out, The Fires of Vesuvius. I may break my not very strict book buying ban and treat myself to that. I have to say I'm finding Ancient Rome a far more interesting subject than I would ever have imagined. My first book for February is The Bookshop that Floated Away by Sarah Henshaw. It's my book five for Bev's Mount TBR 2016 challenge. Anyway, the book. The story is that the author, Sarah Henshaw, puts herself seriously into debt by buying a narrowboat (named Joseph) to turn into a bookshop. It doesn't make much money permanently moored somewhere (oddly, I didn't catch where) so the author decides to take the boat on a trip around the canals of England and Wales, ostensibly to advertise the plight of independent bookshops which as we all know are, for one reason or another, struggling at the moment. No matter that her experience in the matter of canals and canal boats was nil, off she went determined to sell books, hold book group meetings, have author signings and so on. All of these things were achieved to a greater or lesser extent and the book charts the author's experiences as she negotiates locks, meets people - both new to her and people who have read her blog or follow her on Twitter - and deals with various things that occur... quite often disasters of her own making. There is also a bit of talk about books which I quite enjoyed as I always like hearing about the books people love and why. So why, oh why, did this book not really do it for me? It's quite hard to put my finger on to be honest. At no stage did I want to stop reading but I ended up giving it 'two' on Goodreads and even now I'm not sure if that's a bit unfair. The writing was fine and bits of it were interesting and even informative. I suppose I ran out of patience with the author. She was hugely in debt, family and friends clearly concerned for her and helping her out financially, and all the time it felt like she was just playing... at their expense. I feel that if you're going to do this kind of thing you should be able to fund yourself, and also be able to look after yourself as a responsible adult. To be honest, I felt at times like a young teenager had been let loose alone on the canals of England and Wales, when the author is actually in her late twenties. Worrying. There was also a section of the book written from the narrowboat's point of view... Black Beauty style. And while this might sound quirky and fun, it just didn't work for me somehow. Although it served to illustrate that the author was aware that some of her beahviour was immature and she knew what people were thinking, I felt it to be a bit self-indulgent and yes... 'silly'. If anyone really does want to read some good books about canal boating then I would highly recommend Terry Darlington's three books about the trips he and his wife and dog, Jim, took which are a total joy to read. All in all, I think I need to be a bit more restrained next time I'm in Waterstones! Or go with a book list. Or something. January was a fairly average reading month for me with five books read. It felt like more to be honest, possibly because I've had a couple of others ongoing through the month, which are still ongoing, those will hopefully be finished sometime in February. 1. 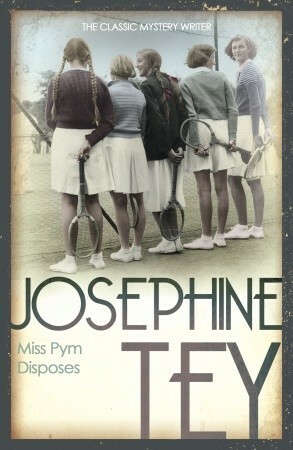 The Franchise Affair - Josephine Tey. A really excellent vintage crime mystery. 2. Angel with Two Faces - Nicola Upson. Murder and skulduggery in 1930s Cornwall. 3. Greece on my Wheels - Edward Enfield. Non-fiction travelogue about cycling in Greece. 4. Mystery in White - J. Jefferson Farjeon. A vinatge mystery with a nice snowy setting. 5. 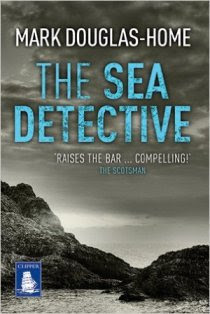 The Sea Detective - Mark Douglas-Home. Scottish based modern crime story. Very happy with the books I read in January. Two of them were terrific, and three good to very good, so I can't complain at that. I certainly have worse months than that! I managed one non-fiction which could be better, though I'm halfway through two more. I really do want to read more non-fiction this year so need to pull my finger out. 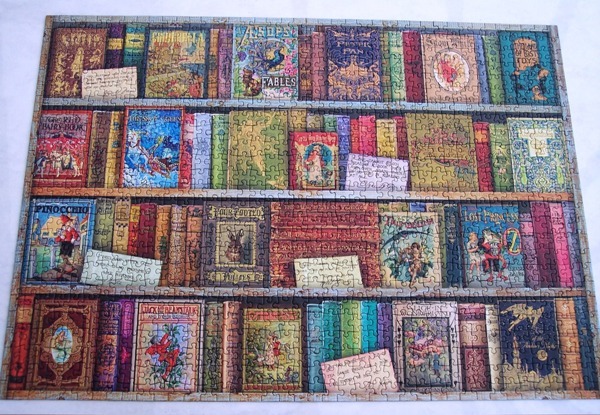 I made a good start on my three challenges, four for Mount TBR, one for The European Reading Challenge and two Vintage Mystery Scavenger Hunt. If I continue that way I shall have no trouble completing these by the ned of the year. *If*. The Sea Detective by Mark Douglas-Home (nephew of British PM, Sir Alec Douglas-Home for those who're interested in these things) was a thoroughly excellent first crime book by this author, well written, a good plot and an excellent setting. Look forward to reading the other two books in this 'new to me' series.